Thanks to everyone who attended the meeting on the 24th of June. We had a great line up of speakers and posters from all over the UK and beyond presenting an excellent cross section of Supramolecular Chemistry, including an outstanding lecture from our plenary speaker Professor A P de Silva. We'd also like to take this opportunity to thank our caterering team who kept us fed and watered and the hospitality staff (Zulfiya Truscott) and members of the Goldup Group who helped keep things running smoothely. Our prize winners deserve special mention for shining in an excellent and crowded field. In no particular order we would like to once again congratulate Thomas Berki (Loughborough, Chem Poster Prize), Davide Marinelli (Cardiff, Elsevier Poster Prize), Chris Taylor (Sheffield, Chem. Commun. 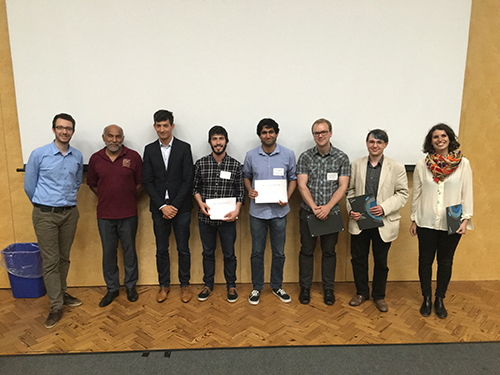 Poster Prize), Chris Dias (Bristol, Nature Chemistry Poster Prize), Ignacio Ignua (Birmingham, Nature Chemistry Talk Prize), Valentina Santolini (Imperial College, Chem. Soc. Rev. Talk Prize) and Daniel Cornwell (York, Org. Biomol. Chem. Talk Prize). We of course have to thank our judges Mike Watkinson (QMUL), Martin Grossel (Southampton), Will Mitchell (Merck), Mansoor D`Lavari (Merck) and Michaela Mühlberg (RSC) for their sterlling work in picking our winners! Perhaps most importantly we would like to thank all of you for attending and enthusiastically participating in the meeting. This was the first year we have run the meeting with an early career focus, providing lots of time for poster sessions and with the vast majority of the talks coming from PhD and Post Doc researchers. We definitely feel the experiment was worth it and we will repeat it next year - thank you! Finally, we are extremely grateful to all of our sponsors for their generous support that has made this meeting possible.